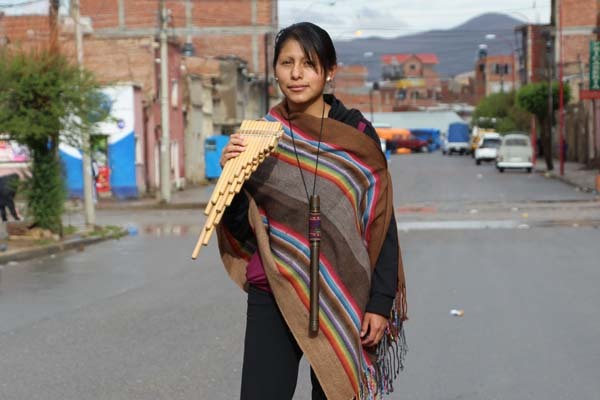 Griselda plays wind instruments in a popular all-women’s music group called Enclave. She listened to the group on the radio as a child and later fulfilled a dream of playing with them. She’s now the group’s youngest member. From traditional folkloric music to hip-hop, sponsored friends around the world are practicing their favorite forms of music and using music to better their worlds and bring peace of mind. 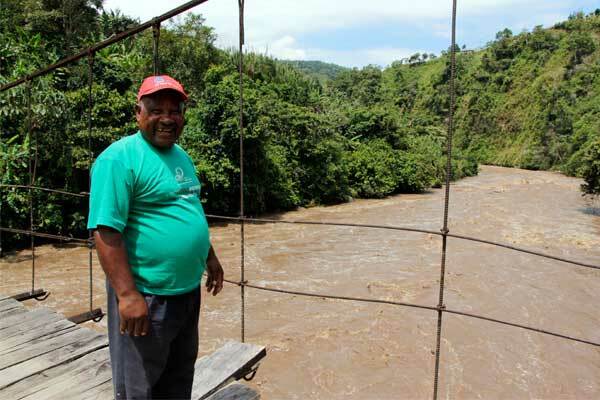 Usebio crosses a bridge on a walk through the mountains surrounding his community in Ecuador. Usebio is a natural-born leader and offers up his own services to anyone who needs them. Through his leadership, he helps others in his mountain community in Ecuador get ahead. And at 69, he’s had a lot of practice as a leader. His community is mostly made up of farmers, and there isn’t always enough work to go around. Tabata, front row, middle, and her family with the mothers group that reached out to help them. They are standing in front of the family’s home. Families who are part of the Unbound sponsorship program are often found at the frontlines of creating positive change in their own communities. And one such example exists in Ecuador. 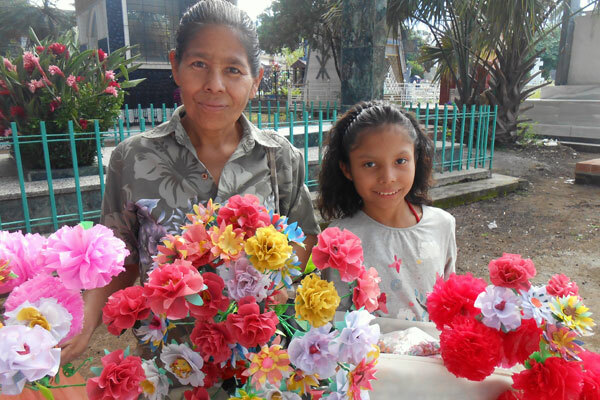 From left: Leti and her daughter Norma sell handmade decorations for Day of the Dead. El Día de los Muertos, Day of the Dead, is a popular holiday in Latin America when people visit the gravesites of loved ones. Headstones are painted, cleaned and adorned with flowers. It’s a time for families to come together to honor their loved ones who have passed on. 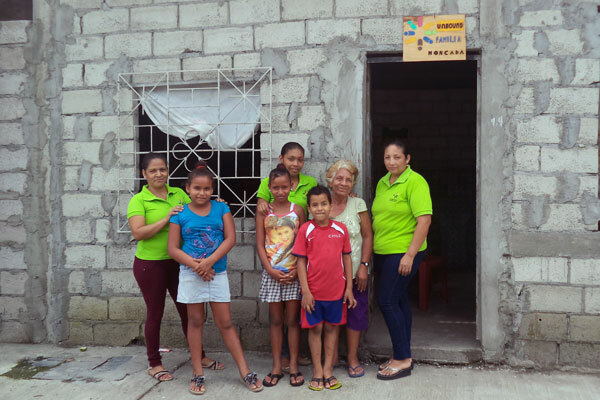 CFCA sponsor Margie O’Connor recently traveled to Ecuador for our first awareness trip to the country. She talks about her trip and how meeting her sponsored friend Inti will always be a great moment in her life. We’ve been receiving almost daily reports from Walk2gether’s progress in Peru. The team has reached its highest point to date at 14,856 feet! Breathtaking natural beauty surrounds us on this highest day of Walk2gether. We have walked this entire day at more than 14,000 feet and peaked at 14,856. With the arrival of Alberto Castro (originally from Colombia), we now have walkers from the United States, Peru, Guatemala, Honduras, Colombia and Ecuador. We left our home base at 2 a.m. to reach our starting point. The camper was running low on gasoline, and we had quite a challenge finding a gas station (called ìgrifoî in Peru) open at this early hour. Very much open to overflowing were the many disco bars, catering to the young people of Juliaca. I pray that with Godís grace and walking together, we can encourage these young people to channel their energies for good. In contrast to the partygoers are the humble peasants, walking through the cold of the early morning carrying heavy loads of fruits, vegetables and handwoven blankets to market. The day started off cold but indescribably beautiful on the high chaparral that goes on forever, adorned by inspiring shepherd families caring for herds of woolly alpacas, llamas and vicunas. The wind kicked up in the afternoon with an abundance of hail. The walkers put on all the clothes we had, and were still very cold. Two of the group took ill from the altitude, but are OK this next morning, gracias a Dios. The storm pelted us but good, and it left the city of Juliaca blanketed in white, looking like Christmas eves of old. But weíre here with Godís people; we carry you in our hearts; weíre safe; weíre getting there; we send our love. After enjoying a phenomenal day with 386 sponsored members and their families, Father Alex and staff on Jan. 2, we have gone deeper and higher into the Andes, and right through a National Reserve for Flora y Fauna. Yesterday and today, we have walked at right around 14,000 feet above sea level. Very cold in the early morning and late afternoon. It’s a challenge to walk at these high altitudes, but itís also a very rewarding privilege to walk with Godís people amidst majestic snow-peaked mountains and hundreds of alpacas, vicunas, llamas and song birds.